One of the coolest ways of selecting a text on a website is to drag your mouse all over the content. While Selecting Text or any other element either on a website or, on your desktop screen a Highlighted color appears, this helps us in the selection. Mostly, the selected area is highlighted with blue color (Default). So what are your thoughts, about changing that highlighted color to something that matches your color scheme? It would give a new touch to your website. We utilized Webkit Just like we did in our previous Scrollbar Modification. The technique is extremely straightforward that it takes seconds to complete. Today in this article, we will learn How to Change the Default Text Selection Color with CSS in Blogger. 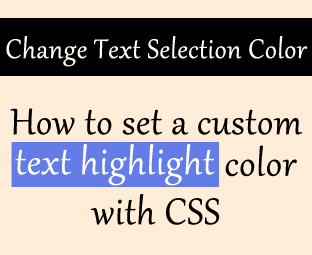 The coolest CSS3 declaration that a person can use today is ::selection, which overrides your default text highlighter color with a color of your choice. At the moment, it works on almost each and every browser that supports Webkit. It’s a sufficient technique that works on modern browsers. However, it gets ignores in old browsers, so it doesn’t make a rich impact. There is no rocket science behind it because the ::selection code does the job with perfection. So to add custom Highlighter Text selection color in your Blogger platform does as follows. (Remember: This tutorial would also work on WordPress or any other platform built with HTML). In the template, search for ]]></b:skin> tag and above it paste the following coding. Replace #ffb7b7 with your personalized color and save the template. All Done: That’s it. Go ahead and check your website we are sure that it would give picture perfect results. This technique may appear small, but its results are delightful. If someone has any questions then, feel free to leave your comment below. is there any trick to change the text color while selecting text? i mean it always stays white.